While the lamb is roasting, we enjoy some mezze ( hors d’ oeuvres). This is a power eating day and not for the faint of stomach! 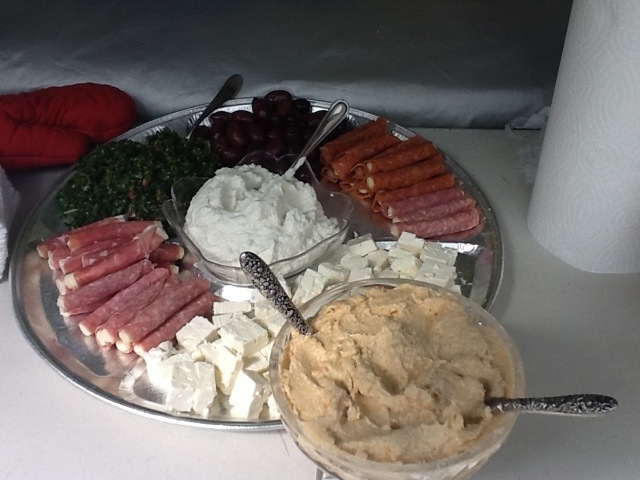 Today we have tabouli, skordalia (garlic spread), olives, taramasalata, pita bread, feta cheese, and other delicacies. The taramasalata is homemade this year. Fish roe, grated onions, lemon juice, bread, water and lots of oil. It is a labor of love but so worth the extra work.